Alberto Machado still hasn’t received a reasonable explanation. It’s been 9½ months since the WBA crowned Gervonta Davis its “super” world super featherweight champion. Machado doesn’t know to this day why he was in effect demoted after winning what he thought was the WBA’s “super” 130-pound championship when he came back to knock out Jezreel Corrales in October 2017. The fact that the WBA promotes championships with the word super in them twice is enough to give anyone sensible a headache. Apparently, referring to 130-pound boxers as junior lightweights wasn’t confusing enough, but let’s not digress. What the WBA continues to do in 10 of boxing’s 17 divisions is nothing short of a sanctioning scam to squeeze much more money from boxers than that Panama-based organization deserves for overseeing title fights. What they’ve done in the case of Davis and Machado, however, is positively preposterous. You couldn’t have concocted a sillier scenario than what’s about to take place Saturday night in Southern California. Baltimore’s Davis (20-0, 19 KOs) will defend the WBA super world super featherweight championship against Mexico’s Hugo Ruiz (39-4, 33 KOs) at Dignity Health Sports Park in Carson, California. About a two-hour drive southeast of the venue until recently known as StubHub Center, in Indio, California, Puerto Rico’s Machado (21-0, 17 KOs) will defend the WBA world super featherweight title against Andrew Cancio (19-4-2, 14 KOs), of Ventura, California. It’s almost as if there’s a bet among WBA officials on how ridiculous they can make this situation. Because if the WBA were truly interested in cleaning up its championship messes in various divisions, it would’ve ordered a Davis-Machado match. That might be the most intriguing fight you could make within the 130-pound division at the moment. Rather than trying to ensure that boxing fans get to witness Davis-Machado – and more importantly, doing what’s right – the WBA will take three percent from the reported purses of four fighters Saturday night for what should amount to one championship. And all at events that’ll be held simultaneously, within driving distance from one another. Think about how brazen that is for a second. Paying less money to sanctioning organizations is one of the primary reasons fighters’ purses often are under-reported to state commissions. These sanctioning shenanigans also are why we can’t keep a fully unified champion in this sport for more than a few months. Imagine the look on Terence Crawford’s face when he learned the six-figure sum he had to pay from his seven-figure purse when he fought Julius Indongo for the IBF, WBA, WBC and WBO 140-pound titles? Crawford wanted to move up to welterweight anyway, but no one in their right mind would’ve paid all four fees had he decided to remain at 140 pounds for one more fight. Unfortunately, the WBA is doing this because it can. Without a national commission that has the authority to stop such utter nonsense from occurring, fighters, managers, promoters, trainers and television executives are entangled in the WBA’s web of perpetual championship confusion. There’s no end in sight, despite the WBA’s claims to the contrary. They’re going to keep double-dipping and even triple-dipping in the four divisions in which it recognizes three champions as long as those titles are valuable to fighters, managers and promoters. In Davis’ case, it just doesn’t seem necessary. He’d still own the IBF junior lightweight title had he simply made weight for his scheduled defense on the Floyd Mayweather-Conor McGregor pay-per-view undercard in August 2017. By giving up his title on the scale the day before he knocked out Francisco Fonseca in the eighth round, Davis finds himself in business with the WBA. Once the WBA noticed Davis didn’t own another title, it happily sanctioned his fight against Argentina’s Jesus Cuellar as a super world super featherweight title fight. Cuellar hadn’t fought in the 16 months since Abner Mares edged him by split decision in their WBA world featherweight title fight in December 2016. That didn’t stop the WBA from ranking him as its No. 1 contender at 130 pounds, which is why his fight versus Davis was sanctioned for the title Davis owns. The other problem was, Machado had already won the WBA’s “super” 130-pound title from Corrales six months earlier. Or so he thought. Some time after the fact, the WBA strangely informed Machado that he had won its world super featherweight title from Corrales. This, despite that the “world” title didn’t exist in its rankings the month it sanctioned Corrales-Machado and there didn’t appear to be a need for a “super” champion. The point is, Machado should’ve been the WBA’s one and only champion at 130 pounds once he beat Corrales. 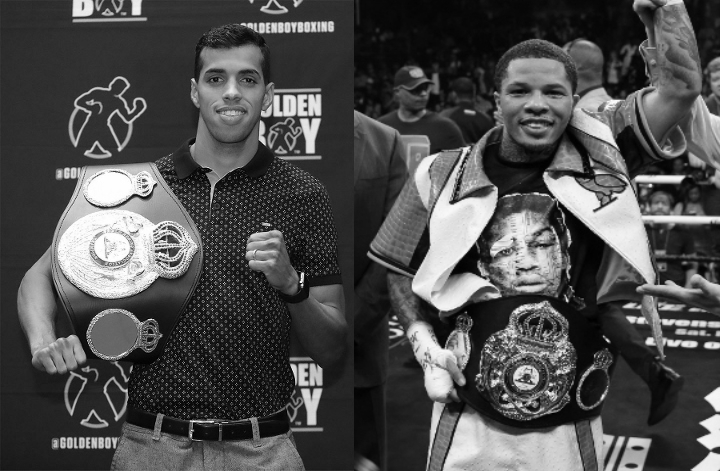 In rare cases – say when a champion is injured or participates in a title unification fight – the WBA could justify declaring a “super” champion. The measure should be temporary, however, not a long-term investment strategy. There simply is no acceptable explanation for why the WBA couldn’t at least have ordered a Davis-Machado fight for Saturday night or sometime soon thereafter. Davis hasn’t fought since he destroyed Cuellar by third-round technical knockout April 21 at Barclays Center in Brooklyn. Machado has defended his title twice since coming back to stop Corrales. There’s no guarantee, of course, that by ordering Davis-Machado that we’d actually see it. Network and streaming-service affiliations – Davis is with Showtime and Machado is with DAZN – further complicate forcing this mandatory match. Four years ago, though, Vasiliy Lomachenko (Bob Arum, HBO) and Gary Russell Jr. (Al Haymon, Showtime) fought on Showtime after the WBO ordered them to fight for its then-vacant featherweight title. And Machado might represent the most credible opponent for Davis within his division. Davis would be favored over him because the 24-year-old southpaw is an uncommon combination of speed, power and skill. But then, the 5-feet-10 Machado is very big for their division – 4½ inches taller than Davis – and a powerful southpaw himself. Davis told BoxingScene.com before a press conference Thursday at the Los Angeles Airport Westin that he wants to fight opponents like Machado and Lomachenko. His promoter, Floyd Mayweather, later clarified during the press conference that he and Mayweather Promotions CEO Leonard Ellerbe ultimately are choosing Davis’ opponents, not Davis. Unfortunately for Davis, he takes the brunt of criticism for Mayweather’s matchmaking. The flip side is that beyond the retired legend’s incredible skill level and grit, Mayweather’s masterful navigation of choosing opponents at the appropriate times helped make him the high-paid professional athlete in sports history. That’s why Davis is trying to remain patient while awaiting stronger challenges than Ruiz is likely to provide Saturday night. The 28-year-old Machado, meanwhile, is left wondering why he and Davis are making optional title defenses against huge underdogs on the same night. He hopes that if he and Davis win, they can fight next. We’d like to do that, Alberto. We just can’t. No one can, certainly not those that run the WBA.